"We're proud of the darkness you will usher into this world." The town of Riverdale has become an epicenter for anything and everything. Student-teacher relationships, gang warfare, prison breakouts (and break-ins)--all of which can be very entertaining. 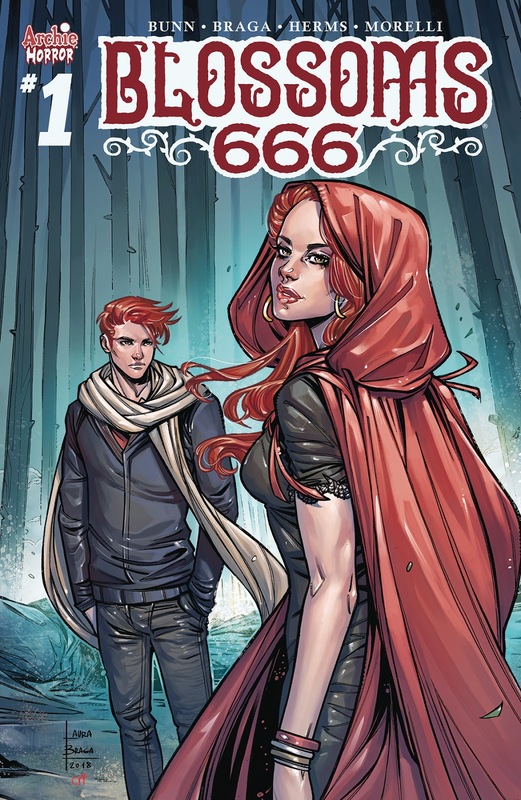 In Blossoms 666 #1 from Archie Comics, the characters enter another level of madness. The issue is written by Cullen Bunn, illustrated by Laura Braga, colored by Matt Herms and lettered by Jack Morelli. The Blossoms represent the "darker" side of Riverdale and Bunn uses that to his advantage in Blossoms 666 #1 as Cheryl and Jason are forced to reconcile their fate with being high schoolers. In this issue, Bunn quickly throws all the key players at the reader so that they know they're all still involved while (very quickly) mentioning the core plot of the series. In fact, Bunn only spends 2-3 pages highlighting the actual Anti-Christ part of the comic; instead, the comic seems to focus more on another high school party with everyone important from Riverdale. Bunn has made a name for himself as a great writer of horror, but the first issue feels a little rushed and not really tense at all. That's not to say that things won't go south quick and Bunn is owed that; there is a tonal undercurrent of Greendale and Sabrina the Teenage Witch pervasive throughout the issue. At this point, everyone in the Archie universe has a very distinct look--a look that Braga absolutely nails in the first issue. Braga's approach is very well done, filling all the characters with a youthful exuberance one would expect of high schoolers at a pool party. Her linework is very refined and adds a sexiness to the characters that fits right in with the show Riverdale. Braga best showcases the personalities of the characters through their facial expressions as her style allows you to very easily see what they're thinking. Herms does a great job on colors, particularly in showcasing the fiery redness of the Blossoms that complements the overarching plot of the series. 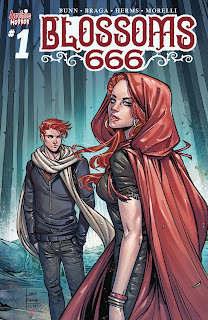 Blossoms 666 #1 is really leaning into the notion that the Blossoms have a darkness to them and that's ok. Leave it to Cheryl and Jason to make becoming the next Anti-Christ a competition that represents an overall darker tone for the series. Bunn's script is jam-packed with witty dialogue and is gearing up for something sinister in future issues. Braga's illustrations are stylish in a way that contemporizes the characters and makes them feel like teenagers. Blossoms 666 #1 is a lot of fun even if the plot is relatively light. Blossoms 666 #1 is available now.